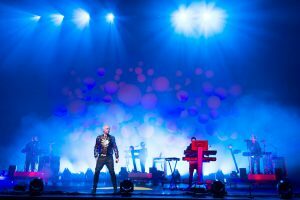 In light of Pet Shop Boys’ upcoming show on the 26th, BOOM talks to Neil Tennant about their Electric show, Hong Kong, and the ultimate dream. Hi Neil. Good year so far? Yeah very good, we’re in Glasgow at the moment. How’s your album Electric been received so far? Well the album came out last year and it’s being doing very well – in fact, it’s the best-reviewed album we’ve ever made. It’s had astonishing reviews all around the world and it sells quite well as well so we’re very pleased. We’re on this Electric tour that started last year, and on Sunday we played our 100th concert of the tour so that’s been going pretty well too. Have you adapted your live show to the album? It’s quite a change of pace musically – it’s clubbier. Well we haven’t adapted it, we’ve done a totally new show, and like the album it’s called Electric. In fact, we were bearing the tour production in mind when we planned the album. As well as making new tracks we were reworking some of the old songs to fit in with the new album style. Every time we tour we will do a completely new production. The last tour was Pandemonium and it was a completely different production with different people in it. Before that we toured our very popular album Yes, which was very poppy so the show was really fun and much poppier than Electric, which is heavier. With this show we worked with this theatre designer called Es Devlin, who is a top theatre designer in London and now works with other musical artists as well. We told him, you know, it’s called Electric so it’s gotta be electric – we wanted lasers and a lot of light. It has a lot of film in it and we have dancers, so when you see the show you’ll see what I mean. You can also see it online – it’s very electronic, very exciting, it moves very fast, is in four different parts, has costume changes, and all the rest of it. But the idea is that it’s very fast and electric; it’s electronic entertainment. Do you feel like you’ve had to adapt your identity to the changes in musical trends? Well what we try to do, every time we do a new tour, is to come up with a totally new and hopefully original concept. You hope that that will then attract a wide audience – from the young people to the old people and the places in between. Originality is what we’re seeking, and we just hope people are going like it. We don’t tend to try to copy what other people are doing; we sort of do our own thing. You’re very well known for putting on incredible shows each time you do a concert. We’re very much looking forward to seeing you in Hong Kong, but a show of that kind of level of technical difficulty must be a hard thing to take on the road. Well we have a lot of experienced people that we work with and also it’s just what we do. I mean, over the years we’ve worked on creating shows that have a very strong theatrical element, but nonetheless it’s a practical issue that the show can be taken down and off somewhere else the next day. We’ve got a lot of experience in that. And that’s a given really: when we have a show it has to be able to work in all sorts of different venues. We might be playing a rock festival to 60 000 people, or we might be playing in an arena. We just played in Newcastle for two nights where we played in a 2000-seat theatre, so it has to fit in all sorts of different places. All of these things got taken into account when we planned the show. In reference to your musical ‘Closer to Heaven’, how did you find it different writing a musical when your shows are already so visually rich? Well we’ve always had an interest in musical theatre. Even the Electric tour is musical theatre in many ways. And right since the beginning we were interested in visualising music on stage, so of course every tour we’ve done we’ve worked with someone from the theatre. We’ve also done, as you said, a musical called Closer to Heaven. A lot of the music was dance music in that but it also had ballads and all the rest of it. It’s a very different thing because you’re writing for characters, so in terms of the lyrics I’m not writing them for Neil Tennant to sing, I’m writing the lyrics for the characters to sing – also to move on the plot and all the rest of it. It’s really fascinating and a very difficult thing to do actually, and I think at some point we’ll do another one. Since then we’ve done things like, well, we just wrote this piece of music called Man From The Future which was debuted at the BBC Proms when we were on tour last month – about the computer pioneer Alan Turing. So yeah, we like to work with a mixture of staging and music, and the musical is just one example of that. We did the ballet three years ago called The Most Incredible Thing. And often we work with the same people, like Es Devlin. The first time we worked with her was in 2001 when she designed that musical. How do you channel these visual ideas into your music videos? Music videos don’t seem quite as important to us as they used to probably. They’re still quite important but people don’t really watch MTV like they used to do. It doesn’t have that sort of blind respect anymore. But even so, we do try to come up with something. We did a beautiful video last year for the last track on Electric which is called ‘Vocal’. In many ways the song was about the feeling of community you get in a club sometimes. We were looking back to the rave scene, so the late 80s early 90s, and we found this guy who had all this vintage footage. [The music video] is really beautiful, and it really captures now and then in the same piece of film. That was a very satisfying video. They have picked up quite a bit of controversy, like the video for ‘Domino Dancing’. What do you think is the most important video, or most important performance, you’ve ever done? We’ve done three videos with Bruce Webber, but the first one we did – which is my favourite – was for the song ‘Being Boring’. It’s just a very beautiful video in a very glamorous way, with all these kids planning a party and having a party and Chris and I just sort of float through it. I think it’s a classic video really. And of the shows we’ve done, well, I most probably like Electric most. But then you know our first ever proper show was actually in Hong Kong. In 1999 we did our first tour – we played Hong Kong for two nights and we did this show directed by the filmmaker Derek Jarman. It was quite a pioneering show because we were working with the dancers who taught Michael Jackson to breakdance and the moonwalk, and Derek Jarman made all these films for us. An amazing costume designer called Sandy Powell, who has won two Oscars, did all the costumes. It was very exciting. There was a scene in the film where two men kissed each other. In those days Hong Kong was a British colony and the Hong Kong sensor said that we had to cut that out, but we couldn’t really cut it out so the projectionist was meant to put his hand over it at that point but on both nights he missed it. Unfortunately when we left Hong Kong the promoter had been arrested, and that was our first experience. What actually was it about Hong Kong that drew you in? We were on the way to Japan, it fitted in; it was just the luck of the draw. But it was an interesting time to be there because it was just a month after Tiananmen Square. What’s bringing us back here is the promoter who’s booked us! No, we love Hong Kong actually. We’ve been there twice recently because in May we played in Australia. Right in the middle of our British tour we had to deviate to do three days in Sydney, so we flew via Hong Kong. On the way there and on the way back Chris and I spent one and a half days off in Hong Kong each way. And I love it; I think Hong Kong is a great city. I think the food, and I like the energy on the streets. I think the setting of Hong Kong is just amazing, on the water and that. I like getting the ferry. We’ve been there quite a lot of times actually. It’s such a cliché, but I think it’s such a vibrant city. It’s got a good art scene too – a friend of ours runs an art gallery there, White Cube. I just think it’s a really exciting place. Any particular bars or restaurants that stick in your mind? Unfortunately we go too rarely, even though we have been a few times. I don’t have a particular…actually, I like eating food in the street, when you sit down at one of those food stalls and eat the food there! That’s what I like. I was once doing that and a Chinese woman complimented me on how I use chopsticks, and to be honest I was just shovelling the noodles in. She said to me, “Wow, you use chopsticks very well!” and I was quite surprised because I thought I was a bit of an amateur at using chopsticks. And just to round it off: Since you’ve already achieved so much, do you still have a goal in life? Do you still have a kind of ultimate dream? The ultimate dream is the everyday dream: to create something original. That’s really what keeps us going. And also, the sort of miracle of making a new song or record: when you go into a studio, you have lots of equipment but ultimately you’ve got nothing. When you come out of it, hopefully you’ve written a song – so you’ve created something that didn’t exist before. And there’s something about that process that is miraculous, but also quite addictive. It’s that addictiveness that probably keeps us going. And likewise when you put a show together, it’s a very exciting process, and it’s like the collaboration when doing that. You know, on this show we have a designer, we have a brilliant choreographer and we have an incredible costume designer who tours with us. We have lighting and lasers – there are two guys who just do lasers on this tour. The collaboration on the whole thing, even with the dancers on the stage, is really enjoyable. I really love doing it.